They say a picture is worth a thousand words, so if you do not have much time to catch up on the important events happening in the world, a great place to get a head start is at Reuters. Here you will find some amazing slideshows available to watch for free. Editor's Choice in the middle panel brings you the best of the uploads from the last 24 hours for completely up to the minute editorial. Just click to launch then use the arrows to scroll through the selection. 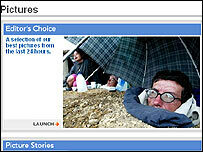 Under picture stories you will find a selection of slideshows telling a whole story, picture by picture. But for me, one of the best sections is Pictures of the Month. This slideshow has two panels, one for the image and one for a description of what you are seeing. There are some powerful images in these pages, revealing many aspects of world events. A real education for the eye and the mind alike. Talking of education for the mind, how smart is yours? You can find out if you pop along to Mensa. 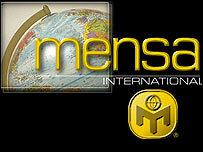 Mensa is an organisation for those with above average IQ, and you have to take a moderated test if you want to join. But before you start jumping the gun, why not try the online workout to see if your grey cells are up to scratch? You need to set aside 30 minutes of quiet time to complete the test, and I suggest you have a pen and paper to hand to scribble things down as you work out the answers, then click to begin the test. There are 30 questions, all based on the same kinds of logic and lateral thinking puzzles you get tested on to join Mensa. There is no timer on the website, so be honest with yourself for an accurate score as the supervised Mensa test is timed. Personally I scored 23, which apparently would qualify me as a member. Do get in touch with us to let us know how you get on. 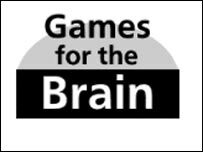 If you found that a bit of a tough workout for your brain you can get into shape in a more leisurely fashion at Games For The Brain. From Suduko to jigsaws to word puzzles and more, there are plenty of brain busting time wasters here for you to enjoy. It is not terribly sophisticatedly presented, but that does not stop it being plenty of fun and nice and quick to load for you narrowband surfers. On the opening page just click the link to the game you want to try. There are tests for your memory, your logic and strategy. Once you select a game the instructions are very clear and simple, and you will be told whether you are right or not after submitting your answer. When you have had enough you can switch to a new game using the links that are now at the bottom of the page. And finally, from brains to idiocy, and a website by a guy who likes to attach himself to helium filled weather balloons and simply float away. 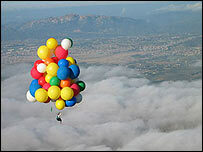 I know it sounds crazy, and I am still not entirely sure if Clusterballoon is for real, but this guy says he really does float up, up, up into the sky using nothing more than a bunch of brightly coloured balloons. And there are plenty of photos and descriptions of flights that would seem to support the fact. I definitely show this to you with the caveat of "don't try this at home", but the pictures and descriptions here should be enough to put you off anyway, especially when you learn that the only way to descend from your flight is to simply pop the balloons that are holding you up. So, hoax or really happening? If anyone knows any more on the subject then please do let us know.